These aloo bread pakoris have a very special place in my heart and the route leading to my rotund tummy (which was once upon a time totally flat). I was once told by a friend’s mother to observe fast on Thursdays for my dad’s health and I did for many months, probably over a year. I was supposed to eat any item made with besan and without salt. My mother used to make these pakoris for me and I would eat them with curd each Thursday, week after week. And they became my special pakoris and they still remain one. The recipe was developed by my mom using dad’s inspirations and preferences in mind. Every time I acknowledge that men in my family were and are very hands-on and comfortable in kitchen, I fill up with great sense of pride. Over decades ago expecting men to know and work in kitchen was mostly unheard of and frowned upon too. But not in my family. Not just my dad, my grandfather not only used to make his own tea but for my grandmom, dad and mom too every morning for many, many years. I am proud to be their child, grandchild and in any way related to them. Respect. 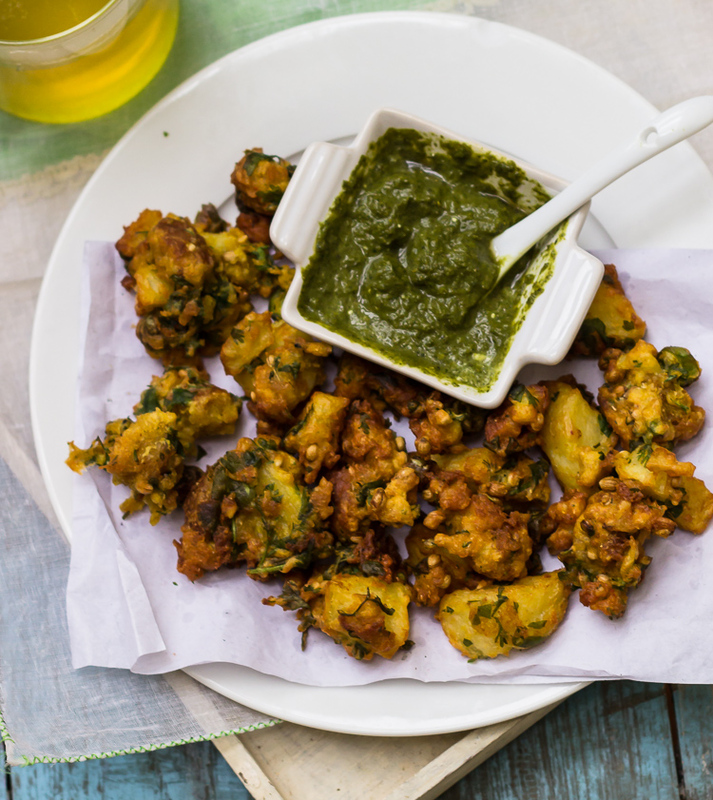 Coming back to the recipe, I served these pakoris with home-made coriander-mint chutney and lemongrass tea to ward off the chill. 1. Peel the potatoes. Cube the bread and potatoes into small squares. Heat oil in a wok for frying. 2. In a small bowl, add all the ingredients together and mix gently. Take care not to completely mash the potatoes and bread as the characteristic of this pakori is the small bite sized crunchy pieces. Deep fry them till nicely brown from all sides. Serve hot with chutney or ketchup and enjoy with a cuppa. a family recipe by my dad. The crunch of the bread and small bite sized squares are the characteristic of this pakori.